Apostle. 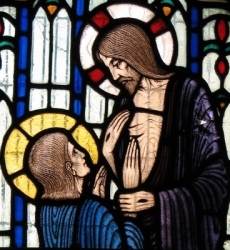 He was ready to die with Jesus when Christ went to Jerusalem, but is best remembered for doubting the Resurrection until allowed to touch Christ's wounds. Preached in Parthia, Persia and India, though he was so reluctant to start the mission that he had to be taken into slavery by a merchant headed that way. He eventually gave in to God's will, was freed, and planted the new Church over a wide area. He formed many parishes and built many churches along the way. An old tradition says that Thomas baptised the wise men from the Nativity into Christianity. Noted scientist, philosopher, scholar, teacher, and writer. He wrote ten books on mathematics alone, and Saint Jerome praised his scholarship and writing. Head of the Aristotlean school in Alexandria, Egypt. However, he was known not just as a scholar but as a humble and deeply religious man. Ignorance horrified him, and part of his work with the poor was to educate them. Held a number of government posts in Alexandria. During a rebellion against the Roman authorities in 263, the area of Alexandria was under seige, resulting in the starvation of both rebels and citizens who had nothing to do with the uprising. Anatolius met with the Romans and negotiated the release of non-combatant children, women, the sick, and the elderly, saving many, and earning him a reputation as a peacemaker. The rebels, freed of caring for the non-combatants, were able to fight even longer. However, when they lost, Anatolius found himself with enemies on each side of the conflict, and he decided to leave Alexandria. Anatolius emigrated to Caesaria, Palestine. His reputation as a scholar and Christian had preceeded him, and he became assistant and advisor to the bishop. In 268, while en route to the Council of Antioch, he passed through Laodicea, Syria. Their bishop, Saint Eusebius of Laodicea, had just died, they saw Anatolius' arrival as a gift from God, and insisted that he assume the bishopric. He accepted, and spent his remaining fifteen years there. Deacon in Alexandria, Egypt, serving under Saint Dionysius the Great. Exiled to Kefro, Libya in the persecutions of emperor Valerian c.255 for refusing to sacrifice to idols, Eusebius went into hiding to avoid the sentence, ministered to other covert Christians for several years, and cared for the sick during a plague outbreak in 260. Negotiated the surrender of women, children and elderly men to Roman troops during a siege of the Brucchium section of Alexandria. Represented his bishop at the Synod of Antioch which dealt with the heresey of Paul of Samosata and the false doctrines of Adoptionism and Monarchianism. Bishop of Laodicea, Syria (modern Latakia, Syria). A shory biography of him was included by Saint Eusebius of Caesarea in his Church History. 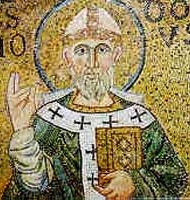 Patriarch of Constantinople from 449 to 458. Known for his simple, austere life, his charity to the poor, his zeal for the faith, and his opposition to heresy. He opposed the heretic Dioscurus at the Council of Chalcedon, and supported the doctrinal authority of Pope Saint Leo the Great, which put him in the midst of both theological and political turmoil. He fought against the Nestorian heresy at the Council of Ephesus. Miraculously healed from a serious illness by Saint Daniel the Stylite. May have been murdered by local heretics for his support of the Pope. Some of his writings, correspondence and hymns have survived the centuries. Prince who became a hermit in Brittany. The local lord, Grallon, gave Gunthiern land on the Isle of Groie, near River Blavet to found a monastery. It survives today as the Benedictine house of Kemperle. Legend says that insects once threatened to destroy the region's crops. Count Guerech I of Vannes, France, requested the saint's help. Gunthiern blessed some water and had it sprinkled over the fields. The insects fled, and the crops were saved. Layman Dominican tertiary and catechist. Died after being imprisoned for his faith during the persecutions of Emperor Minh Mang. Martyr. Pope. Eloquent preacher. Interested in music. Noted for his charity to the poor. Confirmed the Sixth Council of Constantinople in 681 which condemned Monthelitism and censured Pope Honorius I for not doing the same. Secured revocation of the edict of Constans II which proclaimed the bishops of Ravenna, Italy free from the direct jurisdiction of the Bishop of Rome. Layman Christian in the apostolic vicariate of Southeastern Zhili, China. Martyred in the Boxer Rebellion while trying to rescue some women and children from the rebels. A soldier in his youth. Close friend and financial supporter of Saint Jerome, and helped with the logistics of the translation of the Vulgate Bible. Followed Jerome to the east, but declined the life of a desert hermit. Bishop of Altinum, a small town near Venice, Italy which has since disappeared. Fierce opponent of Arianism. Priest in the the apostolic vicariate of West Cochinchina (in modern Vietnam). Member of the Paris Society for Foreign Missions. 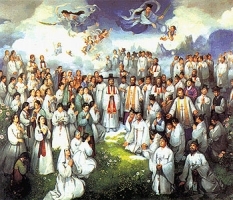 Martyred in the persecutions of Emperor Tu-Duc. Premonstratensian monk. Canon of the monastery in Teplá, Bohemia (in the modern Czech Republic). Abbot of Teplá in 1599; he served in that office for 30 years. Known for his strict adhereance to the Rule of his Order, and commended by diocesan authorities for his work as a Christian catechist and apologist. Deacon. Tortured and martyred with Saint Mustiola for ministering to Christian prisoners, and giving proper burial to martyrs. Nephew of Saint Patrick. Missionary monk in Ireland, Wales and Brittany. Bishop on the Isle of Man where several locations are still named for him. Bishop of Ravenna, Italy during the reign of the Roman emperor Commodus. Elected to the see when a dove miraculously appeared over his head during the deliberations. Chamberlain to the emperor Trajan at Caesarea, Cappadocia. Imprisoned for his faith, his only food was meat that had been offered to idols; he starved rather than touch it. Martyr. Centurian in the imperial army in the reign of Diocletian and Maximian. Convert, brought to the faith by Saint Severus. Tortured and murdered for his new faith. Martyr. May have been Irish royalty. Hermit at Oostkerk, Flanders, Belgium. Abbot of Knock, Louth, Ireland. Noted as a poet. Martyr of the early Church for refusing to sacrifice to idols. A holy man with some connection to Carnarvon, Wales. Monk. Abbot of a monastery near Douai, France. Friend of and extensive correspondent with Saint Anselm of Canterbury. Monk. Elected abbot in Iona Abbey in Scotland in 726. Martyr of the early Church, executed for encouraging other martyrs not to lose their faith. Early bishop on the Isle of Man. Thirteen Christian companions marytred together. No details about them have survived but the names - Apricus, Cyrion (2 of), Eulogius, Hemerion, Julian, Julius, Justus, Menelaus, Orestes, Porfyrios and Tryphon (2 of). A group of 24 Christians martyred in the persecutions of Arian emperor Valens. We know little more than their names – Acacios, Amedinos, Ammonius, Ammus, Cerealis, Cionia, Cionius, Cyrianus, Demetrius, Eulogius (2), Euphemia, Heliodoros, Heraclios, Horestes, Jocundus, Julian, Martyrios, Menelaeus, Sestratus, Strategos, Thomas, Timotheos and Tryphon. Six Christians who were imprisoned, tortured and martyred together in the persecutions of Trajan. Saint Hyacinth ministered to them in prison. We know nothing else about them but their names - Asclepiodotus, Diomedes, Eulampius, Golinduchus, Theodota and Theodotus.